Dec 4, 2013 – Thanksgiving is further away, but WonderFox Soft will continue to surprise its consumers with WonderFox Weekly Giveaway Campaign held on its Facebook page. Today they pushed out profitable Video to Picture Converter from Dec 4 to Dec 10, 2013. Video to Picture is a pretty interesting and handy application designed to provide you with efficient means of creating image sequences or GIF animations from your favorite movies in few clicks. Prefer to make animated GIF by yourself? 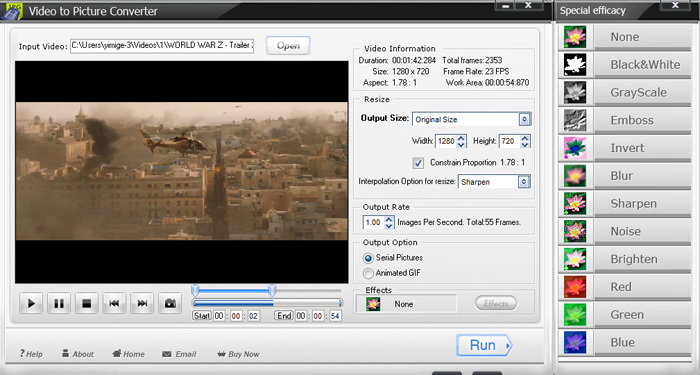 Don’t miss this chance to get the newly-updated Video to Picture Converter for free. WonderFox Video to Picture Converter is a simple solution for converting video frames to seriate pictures or animated GIF files. It is very easy to convert video file like AVI, MPG, WMV, MKV, MOV, MP4, 3GP, RMVB to picture files in a wide range of formats like JPG, GIF, BMP, TGA, TIF, PCX, ICO, etc. You can still capture single picture from video in a click. This Video to Picture Convert also allows you to select any period of times which you want to get output, such as just convert beginning part or ending part to animated GIFs. Another useful function is rate setting. You can set 24 frames per second to get the animated GIF as same as video or just 1 frame per second to get animated GIF with small size. Variety of special effects (black and white, gray scale, emboss, invert, blue, sharpen, noise, brighten, etc.) will bring more fun on the video to GIF conversion process, the better is everybody able to make special effects by one click. And, it will not extend the time of conversion process. WonderFox Video to Picture Converter is really a handy tool to save your fond part of video into image file without save the whole movie. Grab this valuable chance to get it free. What’s more, WonderFox Soft also has a daily discount offer with different Windows programs giving out continuously. Share the post on its Facebook, you can possibly have a chance to get Life-time Upgraded license of its products. Visit the Facebook page to get more promotion information. 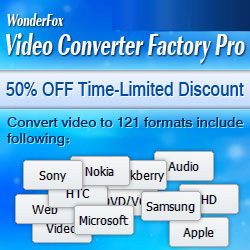 WonderFox Video to Picture Converter regularly priced at $19.95 is completely free from now to Dec 10, 2013. Please download and register it with the license code offered at WonderFox Soft Facebook Page.